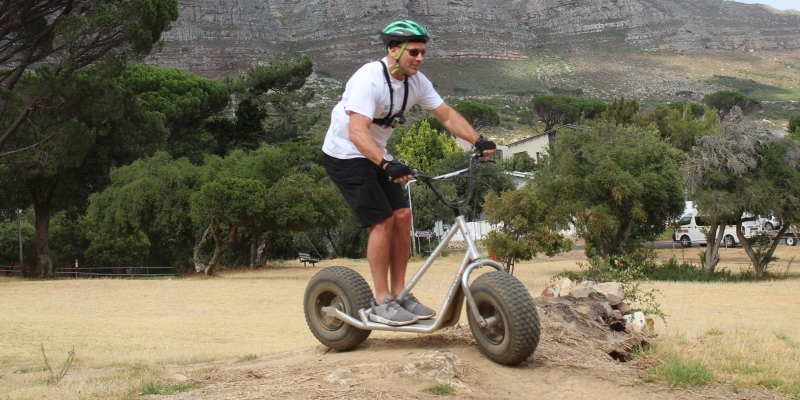 Experience the off-road trails of Table Mountain on a unique non-motorized scooter during this two hour tour! 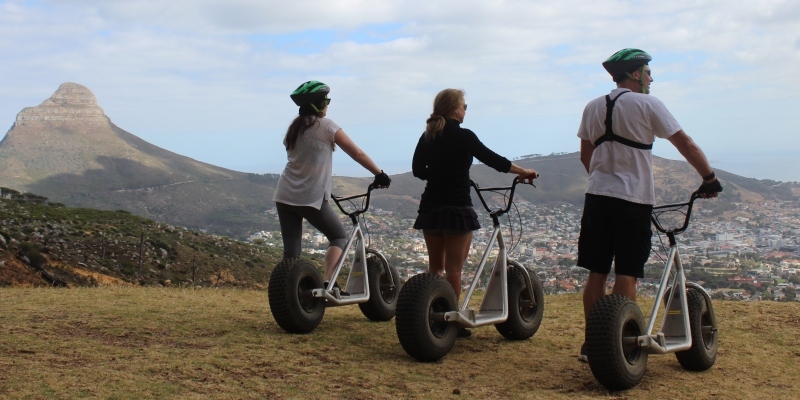 You've heard of walking tours, food tours, and bike tours, but did you know about Scootours? The clue is in the name; adult-sized fat tire non-motorised scooters that are both thrilling to ride and perfect for sightseeing! 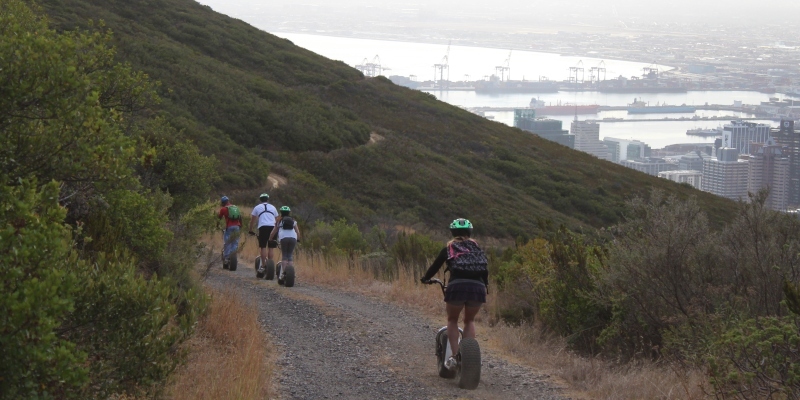 Hop on and glide down Table Mountain and Signal Hill during this exciting two hour adventure. Meeting at the Lower Table Mountain information office, guests will meet the expert instructor and get kitted out in helmets and gloves, before being transported to the top of Signal Hill. This is a sightseeing tour so the guide will regale you with stories of the local area, but the main part is the adrenaline-pumping off-road ride down to the bottom! If you're not ready to go home just yet then fear not, as the group will be transported up again, this time to Dead Man's Tree on Table Mountain. The eco-friendly scooters are easy to ride, smoothly gliding down to Deer Park where you'll once again be taken to the start point. This is definitely sightseeing with a difference! 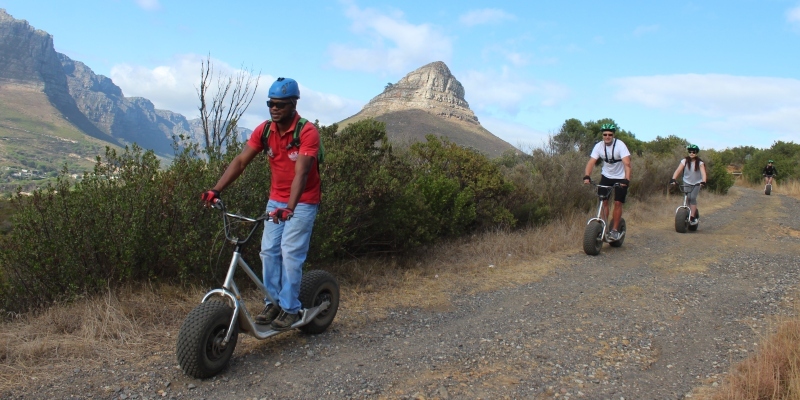 The Table Mountain Scootour Experience is perfect for families or friends looking to explore Cape Town in style, and makes a great gift for the outdoor adventurer in your life. Scootours run throughout the year Tuesday - Sunday, with departures at 9am, 12pm and 3pm. All drivers need to be able to ride a bike. 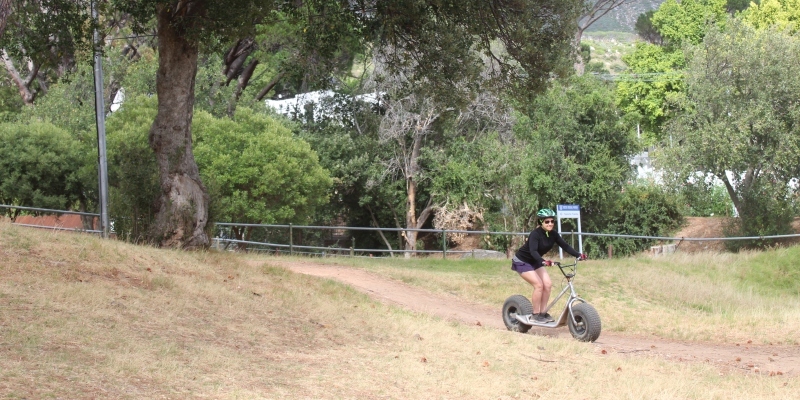 The tour lasts approximately two hours with two runs - one down Signal Hill and one down Table Mountain. Participants: The Cape Town Table Mountain Scootour Experience is for 1 participant. Groups of more than 9 can be arranged at special request. Helmets and gloves are provided. Just like the other reviewer, I thought this was a little more extreme than expected but still great fun once you get used to controlling the scooters. One of our party chickened out after the first run (Michelle, you know who you are). Great guide and assistant who takes photos at picturesque points down the mountain which are available to purchase afterwards. I'd certainly do it again. This was my first experience on an off-road scooter. The guides were friendly and encouraging. They took their time with each member of our group as they taught us to ride the scooters down the dirt roads of Signal Hill and Table Mountain. In addition to discussing points of interest throughout the tour, they also made sure to capture some great photos of our group! More extreme than I was expecting! The Signal Hill/Table Mountain Scootour was totally surreal and hugely enjoyable, our guides EK and G were fantastic and the whole day is organised very well. It was a little more extreme than I was expecting, but you pick it up quickly and then it's super fun! 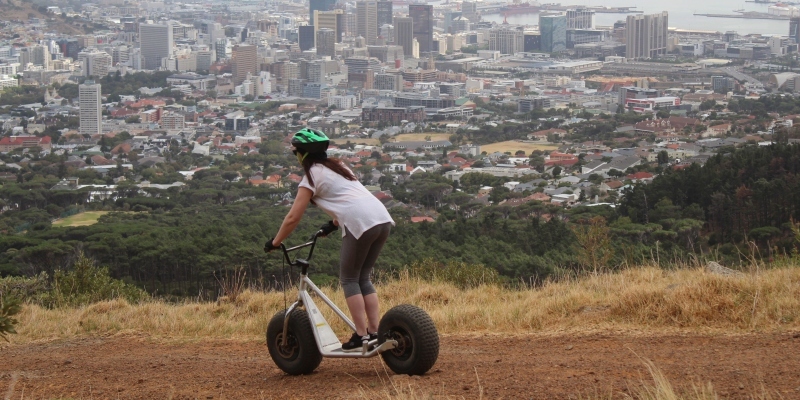 A unique way to go sightseeing in Cape Town. What's a Scootour, I hear you say? Think micro-scooter combined with mountain bike, plus a guided city tour, and you've got yourself a Scootour! These unique and innovative experiences seemed too fun to pass up, so we made sure to get one booked in before we had to leave Cape Town. We met our guides EK and G at the Table Mountain car park, then hopped in the van for the first ride up Signal Hill. They were super friendly and chatted away the whole time, letting us know what we were getting ourselves in to and explaining how the day is organised. At the top of the hill we were given helmets and gloves, then taken through a brief training session on how to steer, brake, and control the scooters - and we were off! After about ten seconds Michelle and I both realised that this wasn't going to be the gentle downhill jaunt we'd been expecting; the slopes were steep, the ground uneven, and the scooters go fast. It was clear the experience was going to be far more extreme than we'd anticipated! G was a great guide and very patient with us (well, with me and Michelle, Robb was fine). Luckily we had a private tour, otherwise I would have felt guilty for holding up other people! It does get easier though, and as my confidence grew I started to really enjoy the speed - and could even take my eyes off the road long enough to appreciate the amazing views! EK was waiting with the van at the bottom of the run ready to take us up for Round 2, this time on Table Mountain. This route had more slopes, bends, and narrow tracks that showed off the scooters' capabilities (and my lack of), so was a lot more adventurous than the first run. There were even a couple of jumps at the end! Overall, I have to say this experience wasn't what I was expecting, but in a good way! It's a lot more physical than I'd imagined, but that was probably a good thing after two weeks of lying by a pool. Huge thanks to EK and G for providing such a fantastic experience, I'd recommend the Scootour to anyone looking for outdoor action and scenic views!